Nope, not pulling the plug on podcasting, but pulling the plug on a project when it's just not working. 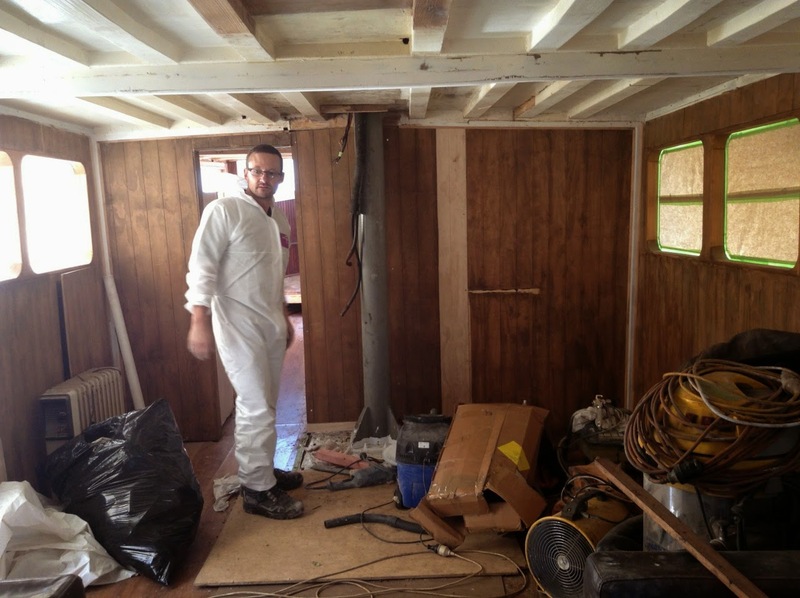 Today I give a (not so brief) life update, including a rundown on the boat renovations. 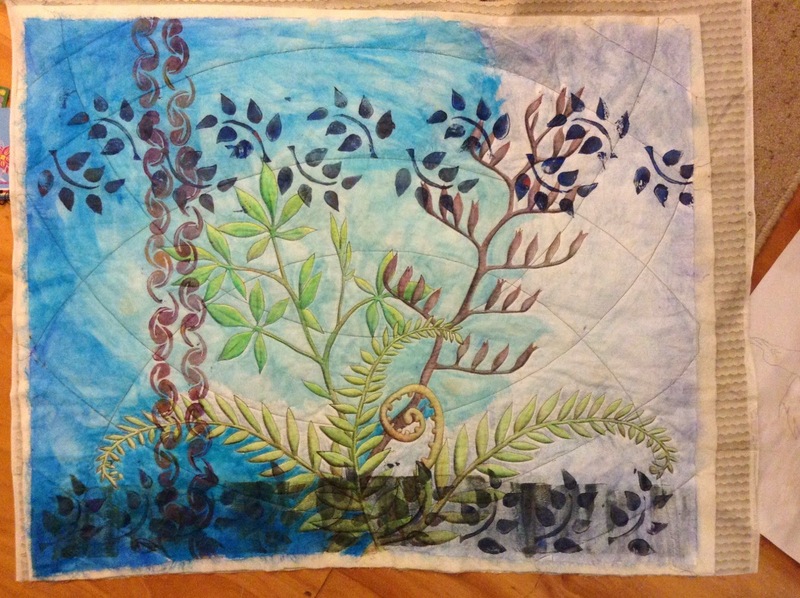 I then talk about what's going on in my quilting world, including how I had to admit defeat and decide not to push through and try and meet my latest quilting deadline. I also talk about my SAQA donation quilt, my summer postcard swap and other quilty bits and pieces. 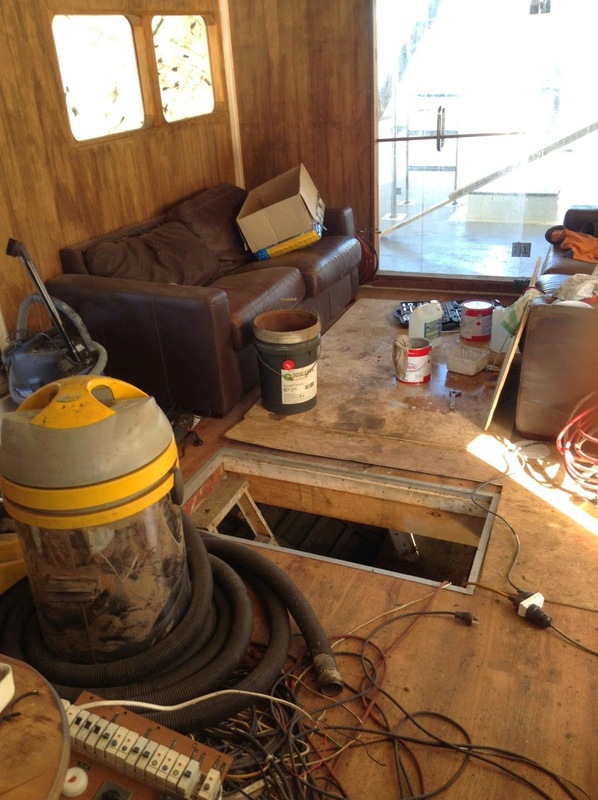 Every week sees more progress on the renovation of MV Cerego. It's taking longer than we hoped, but we knew we were being overoptimistic when we originally said six weeks, so we are not surprised. I'm getting a bit jaded now as Hubby stays late after work to get more done, then weekends are filled with him on the boat and me looking after the children. In the beginning we all went down to the boat, but now it's too smelly, wet-painty, messy and dangerous for the kids. I love my kids, but 'solo-parenting' can wear you down! When I get like this (whiney), I start trying to spend five minutes a day writing down the things I'm grateful for. Like a healthy family, a good job, the opportunity to live on a boat, down to the ridiculous - like being thankful that ALL the chickens went into their pen without requiring chasing! It works to remind me to get over myself. On to the boat pictures. 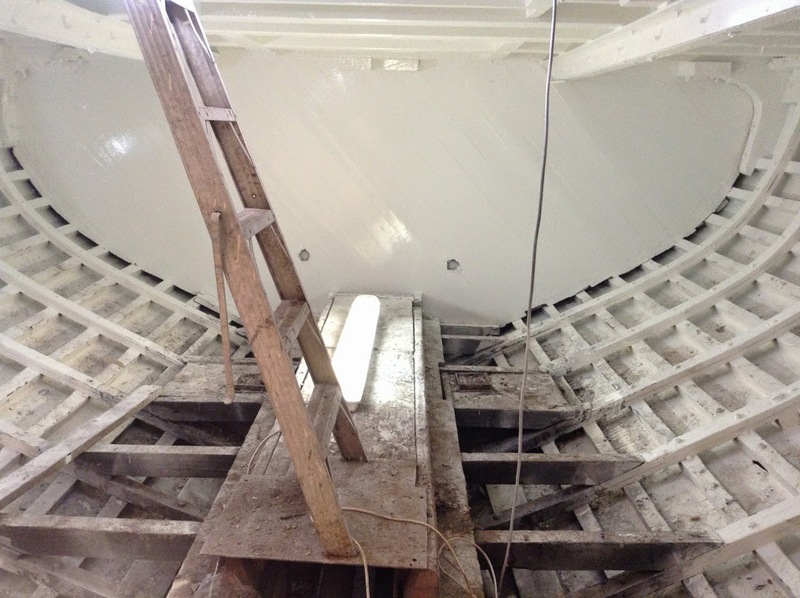 Above is the newly replaced belting, complete with a coat of primer. This bit of wood was completely rotten, but it's not structural, instead it's designed to rub against docks etcetera and so is 'sacrificial' as such. The top deck had a few rotten bits too. They've all been replaced now and everything sanded back ready for fibreglassing. The boys have got over half of the fibreglassing down now. This really needed to be done as there were a few leaks coming through from up here. Not good! Here's my dear Hubby in his fibreglassing coveralls - pretty flattering aren't they?! Don't worry, he never reads my blog. Beside him is the wall where my sewing corner is going to be. It had a funny cupboard and bench thingy built to cover the pole in the middle. The cupboard and bench were even more awkwardly shaped than the pole so they've been ripped out and there is heaps more usable room now. You can see where we've ripped off the ceiling panelling too - these beams will all be painted glossy white. Below is a before pic. 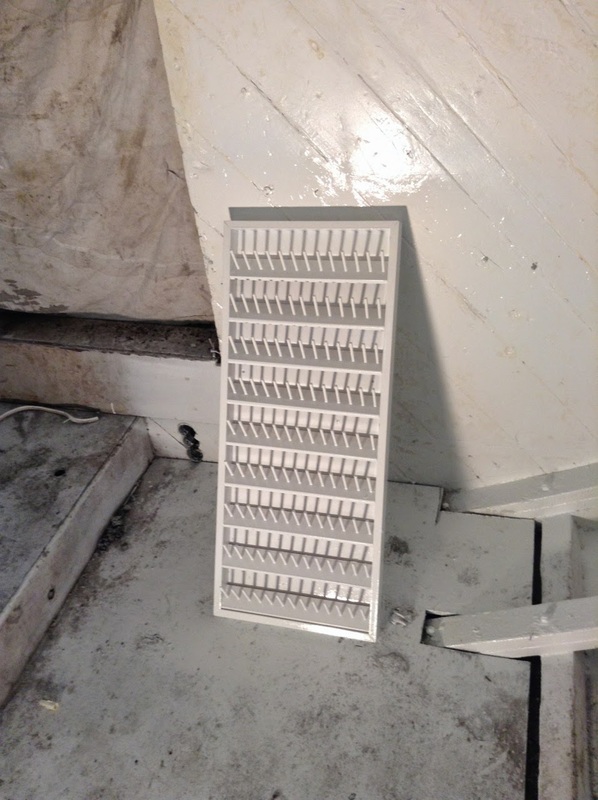 Talking about glossy white, here is the former dark, dingy, dirty fish hold! It's all shiny and bright white now and ready for the carpenter to come in and start building floors and walls and bunks. 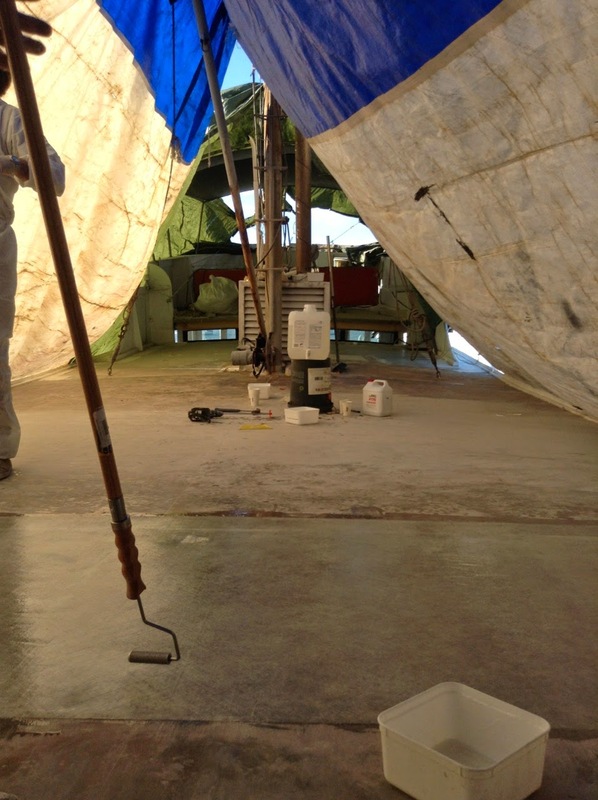 Once the building is finished then everything will get a last coat of paint. I snuck in a thread holding unit that was just MDF timber and the magic spray gun painter has turned it a pretty white too. My friend gave me a giant sized thread cupboard last year before she left the country but I don't think it will fit on the boat, so I'm getting other options ready. 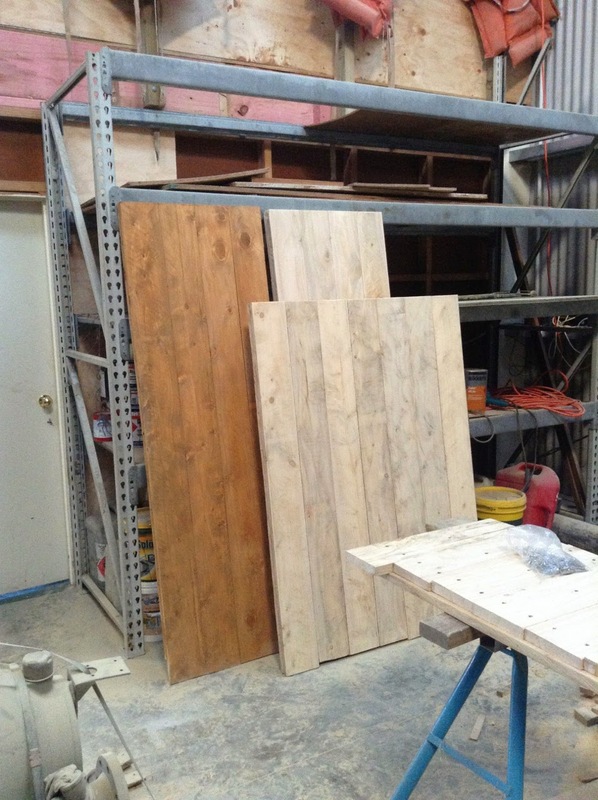 The carpenter couldn't start on the walls and floors, but he has started on the doors. He's made two cabin doors and the square one is for the engine room. They will remain as a timber finish, like the one on the left. On the work trestle in the front of the picture you can see the small door he's working on for the engine room hatch. Can you see the double thickness? They are all constructed like that, as will be the walls. Very substantial. That's it for the update. I'm looking forward to when I can show cabin construction, then I'll really feel like we are making progress. These are the process photos since you saw it last. I filled in the background with neocolor water soluble pastels. Being crayon-like, you can turn them on their side and use them to block in colour quickly. I would also like to experiment with some other brands as this is the only one I've used so far. Here it is fully painted. You need to heat set textile medium, so I ironed it using a pressing cloth. Be careful! There are a couple spots where I lightly scorched it and slightly discoloured the pastel (it matches the cat paw prints and I'm calling it 'texture'). 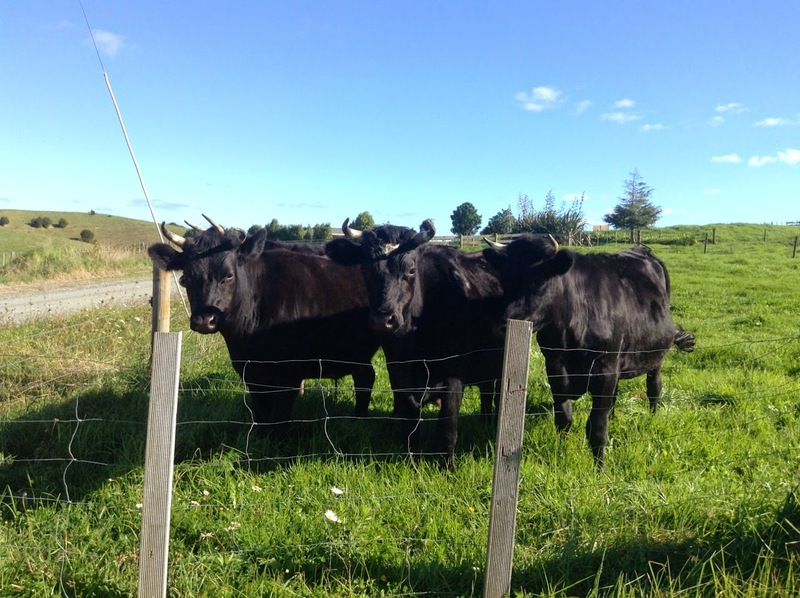 You can hardly see it, but there are Kerikeri street names written lightly on the background. Again, they were done in coloured pencil. I had the appliqué letters in the middle originally but they were lost against the foliage. With a bit of shuffling and auditioning I found they sit perfectly against the darker stripe that I had painted on the bottom edge. I fused the letters onto the background (they are cut from my hand-dyed fabrics) and then free-motion quilted/appliqued them onto the background using two rounds of black thread. The binding is machine stitched. I made a hanging sleeve and pinned it along the back top edge, then applied the binding on the back side first (so I'm sewing the binding and one edge of the hanging sleeve in one go). Then I flip the quilt over, fold the binding over the edge and onto the front, and pin it so it sits just over the line of machine stitching that shows from where I sewed it onto the back. Then I straight stitch from the front side, about 1/8 inch in from the edge and this catches both the front and the back neatly. That's a really short explanation of how I do my machine bindings - leave me a comment if you want me to do an expanded explanation with pictures. Now I have a week left for my next quilt deadline. I'm not so optimistic about getting that one finished, but I'll give it a go. Stay tuned for a Cerego renovation update tomorrow! First up, I need to apologise. My answering of comments got a little behind, and then a little more behind and then I got completely lost. So if you've commented on the blog recently and I haven't answered you by email (if you are a reply-enabled commenter), sorry! And I'm sorting it out. I'm going to set up a separate email account just for comments so they don't get jumbled into my every day emails and then lost in the clutter. It's a busy time for us at the moment with trying to renovate Cerego to liveable standards and I'm trying to downsize a little everyday so there isn't a mad scramble when we move. Plus this month I'm working as a locum midwife, so a lot more hours than I usually work and I'm still doing my normal work shifts too. Then I sat down and wrote a list of quilts and projects that I'm working on at the moment and checked all the deadlines (for the ones that have deadlines).....and took a huge gulp. I have two projects with scary deadlines - one in just over a week and one in just over two weeks. Both of them I want to do and the first one I also feel obligated to do because it's for my local club. So I've set to with a vengeance. 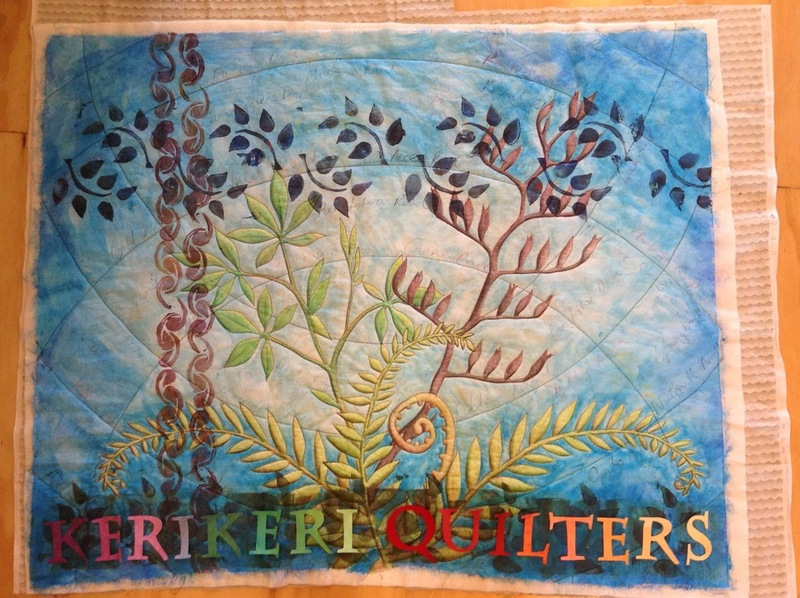 The first project is a banner advertising my quilt club. We are having a regional day in July and it's our turn to host. The three other regional clubs are invited. We will have speakers, show and tell and vendors. We provide a lunch and we participate in a challenge - and this banner is the challenge. 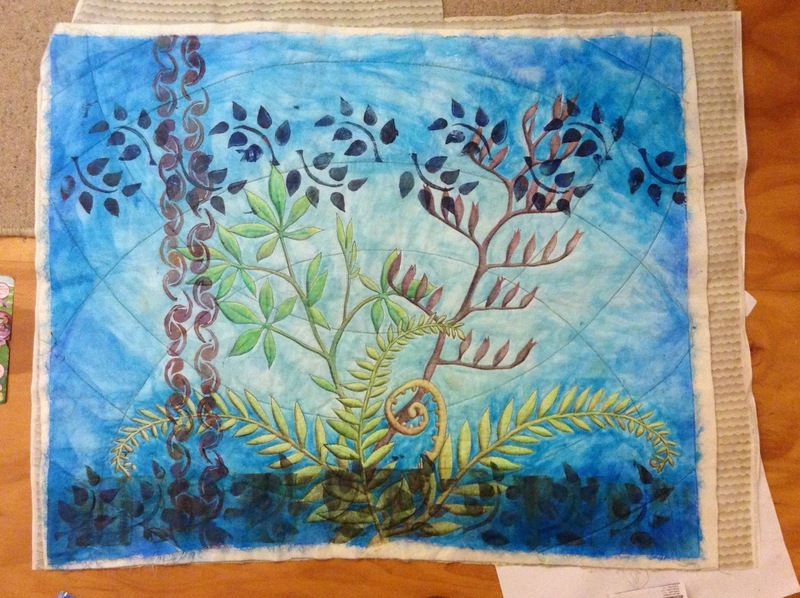 It must fit within a metre square, have three layers and be quilted and have the words 'Kerikeri' on it somewhere. I also quilted some curves in the background to provide a bit more stability and some structure for where I'm going to appliqué the words. 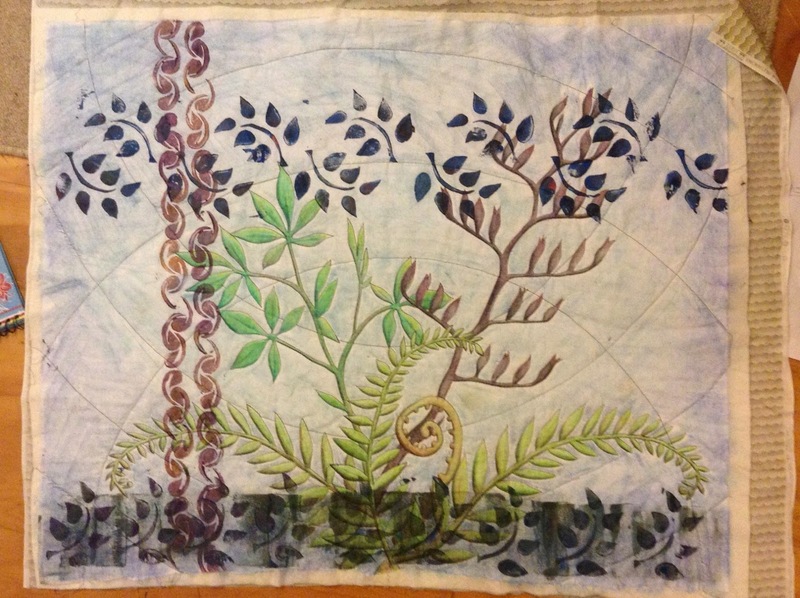 This morning I spent the whole swimming lesson then playground session with my coloured pencils, filling in the quilted foliage. Then tonight I've started painting over the pencil with fabric medium. 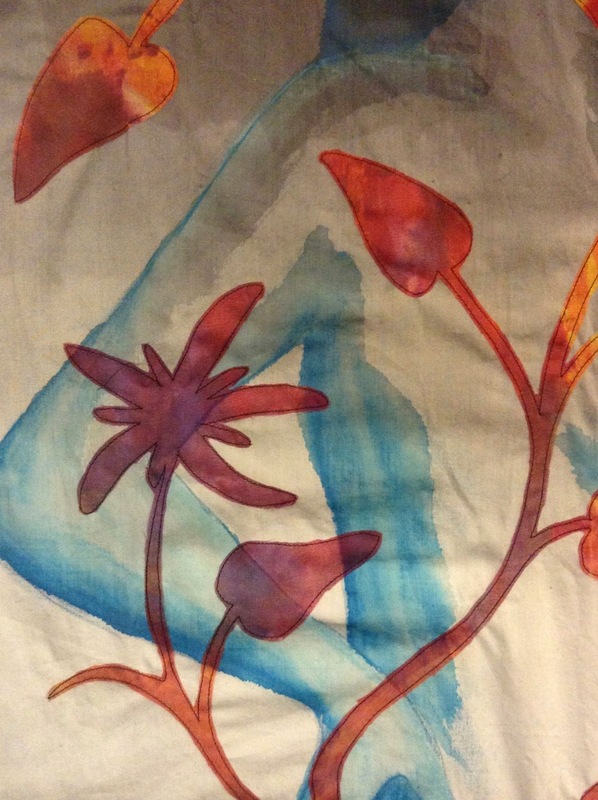 It sets it, stops it rubbing off on the rest of the quilt and makes it more intense and a bit more like watercolour. I'm not investing a lot of design time on this, I'm aiming for finished rather than perfect. It is a challenge and there will be a winner picked but I'm entering more to support my club rather than because it's something that really speaks to me. Hopefully I'll get a whole lot more progress done on this soon! 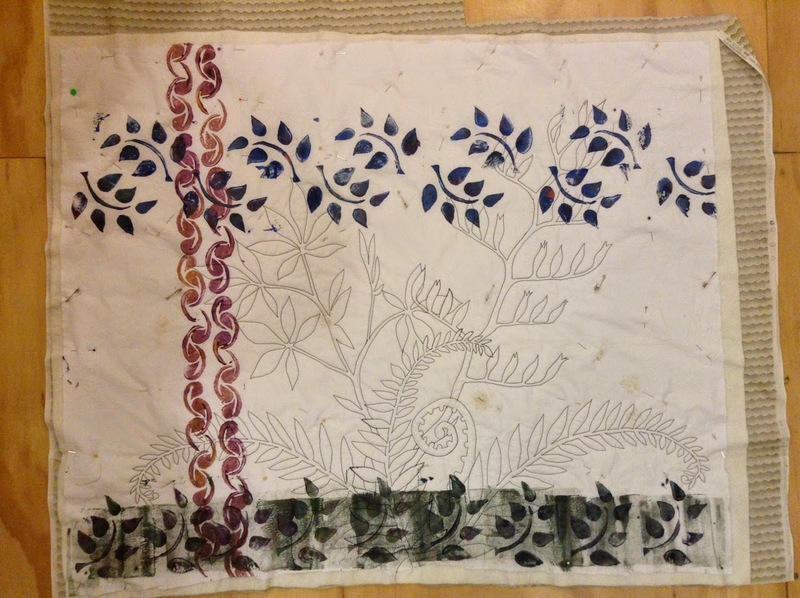 How to machine quilt around hand embroidery. 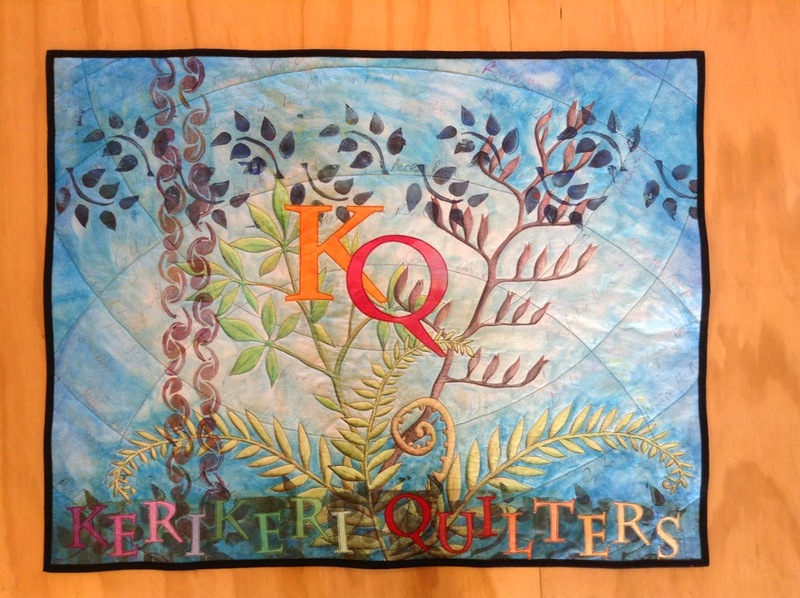 Recently I've been quilting a secret-squirrel project. I think I'm safe showing you the snippet above, but you'll have to wait to see the whole thing, sorry. 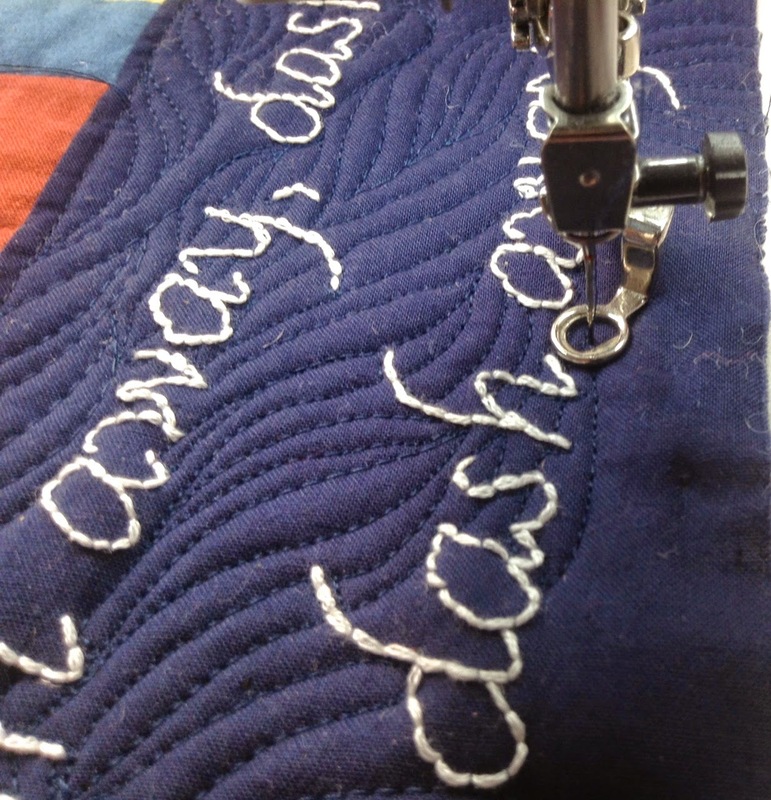 I included a little bit of backstitch embroidery and thought I'd share a few things I've learnt about machine quilting around hand embroidery. Don't quilt over your embroidery. Just like beautiful appliqué is spoilt by an all-over quilting design, so is stitchery. Use a complimentary design. 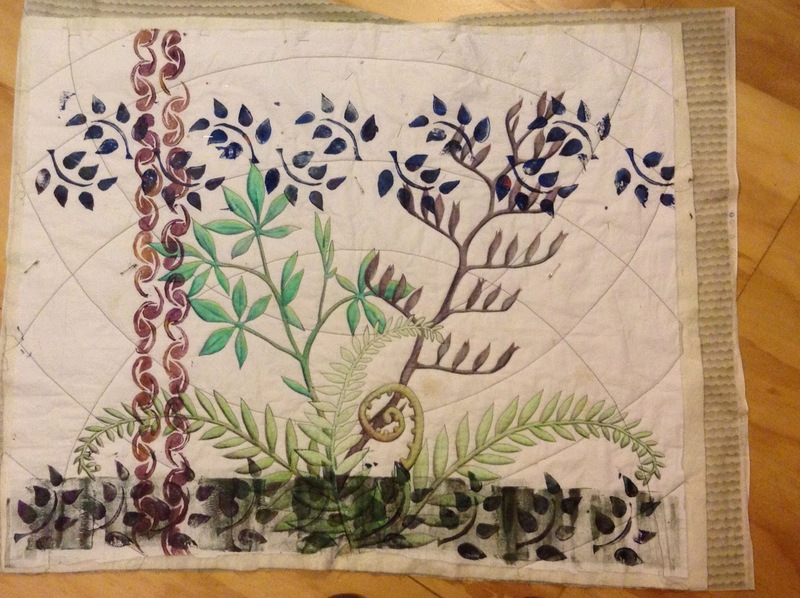 A vine and flower design is good for floral quilts, but a square spiral might look a little odd. Stippling and other filler designs work well to push the background back and highlight your embroidery. Quilt through the design if appropriate. You can see in the photo above that I've quilted the inside of some letters but not others. The ones I haven't quilted stand out and I'll need to go back and fill them in or they will draw your eye when the quilt is on the wall. Go slow when you are getting close to your embroidery. 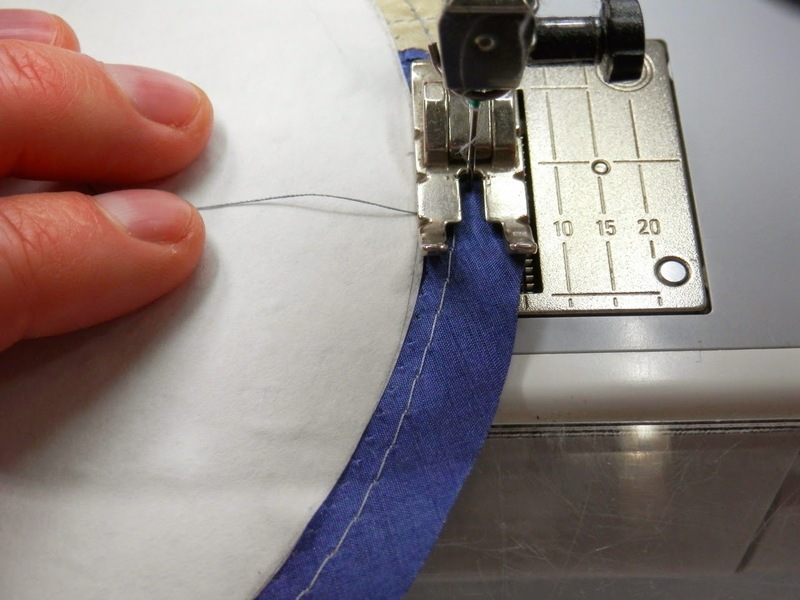 You can run your quilting line down along your embroidery edge and then move back out rather than stopping and starting your quilting every time you get to the embroidery. You can even use a stiletto to gently move your embroidery stitches out of the way if they are not too small and tight. If you do accidentally quilt over your embroidery, an appropriately coloured fabric marker is your best friend! 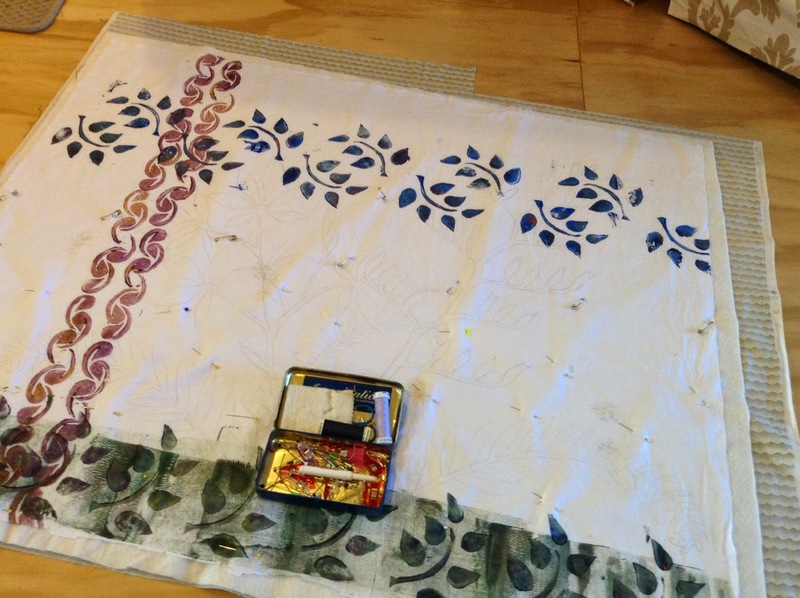 Use a white gel marker if your embroidery is white or cream and your quilting thread is dark. What about you? 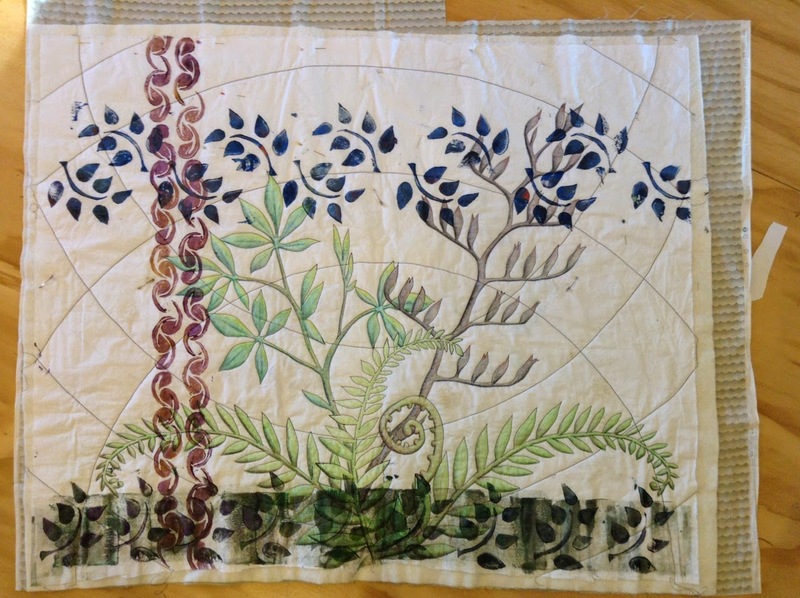 Have you ever quilted around hand embroidery? Do you have any other tips to add? 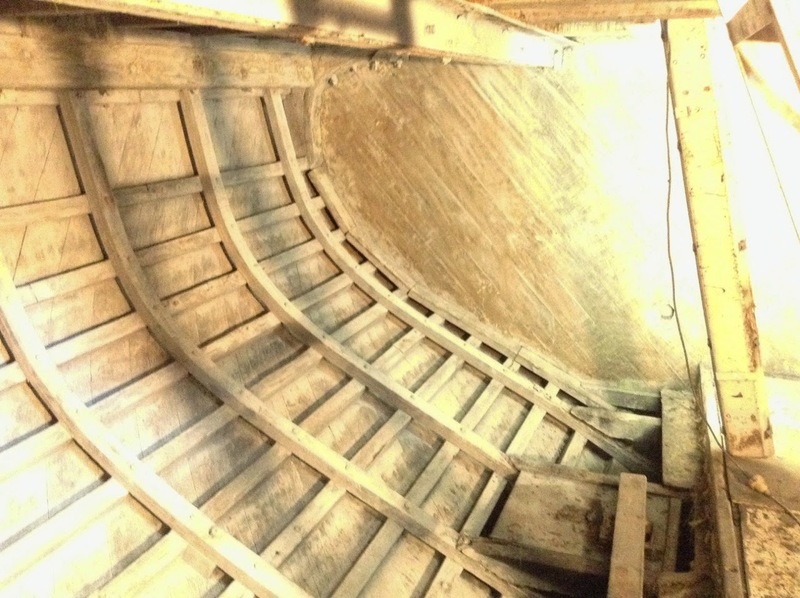 Update of the renovation of the Vessel Cerego. 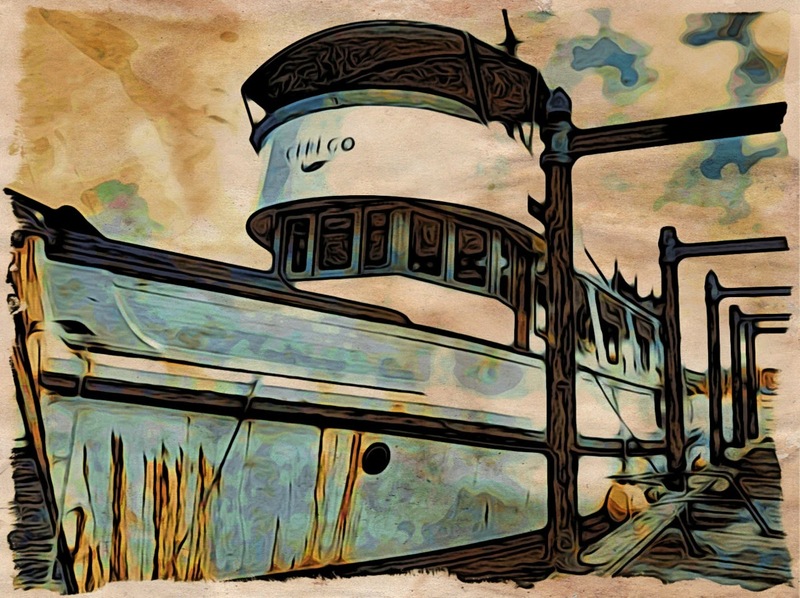 I played with a photograph of Cerego in the app called Moku Hanga - and, with just a few commands, made her into an interesting, and I think, beautiful picture. In real life, Cerego is not looking a pretty picture. In fact, she's looking a right mess. I keep telling myself that she has to look worse before she looks better, but sometimes it's hard to remember that when you are tripping over a bunch of wires, sweeping up rusty, cruddy insulation crumbs or pulling out piles of greasy, unidentifiable junk from the lazarette (another new word - it is the back store room/hatch/cupboard thingymabob). 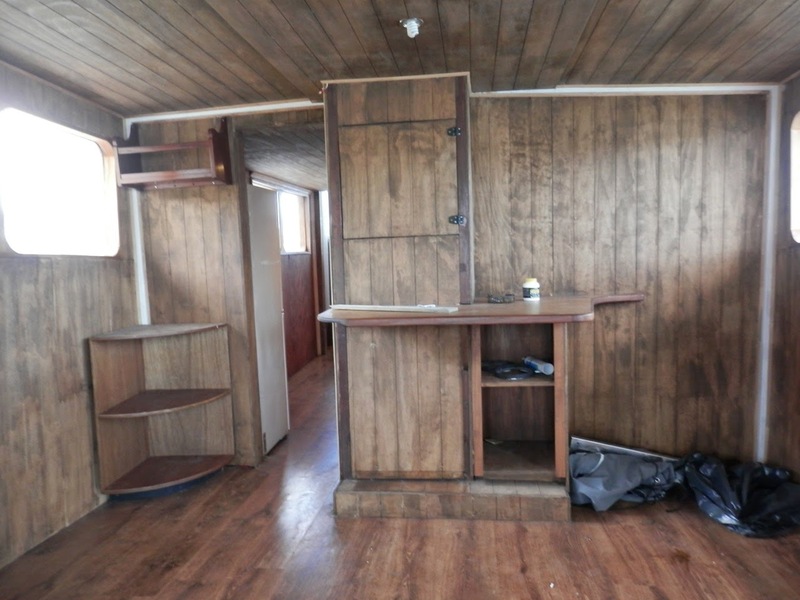 The picture above is the main saloon. The R2D2 looking thing is a heavy duty vacuum cleaner (and it's needed, believe me). 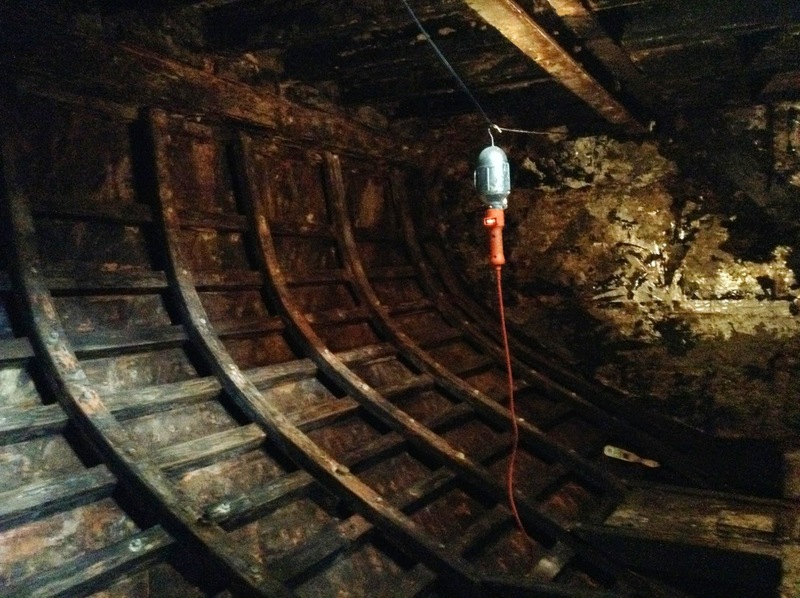 The entire boat needs re-wiring. It's a big job, but it's simpler and safer than trying to sort out all the patching and bodging and adding that's been done over the years. We are pulling off the dark ceiling panelling (that wasn't very well installed in the first place). 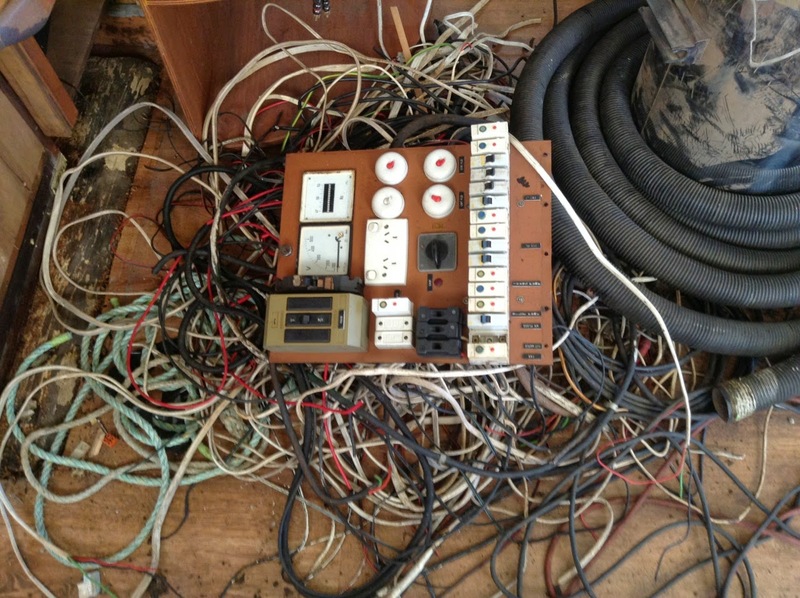 This needs to be done to re-wire, but we aren't going to put it back on. We will paint the ceiling white. 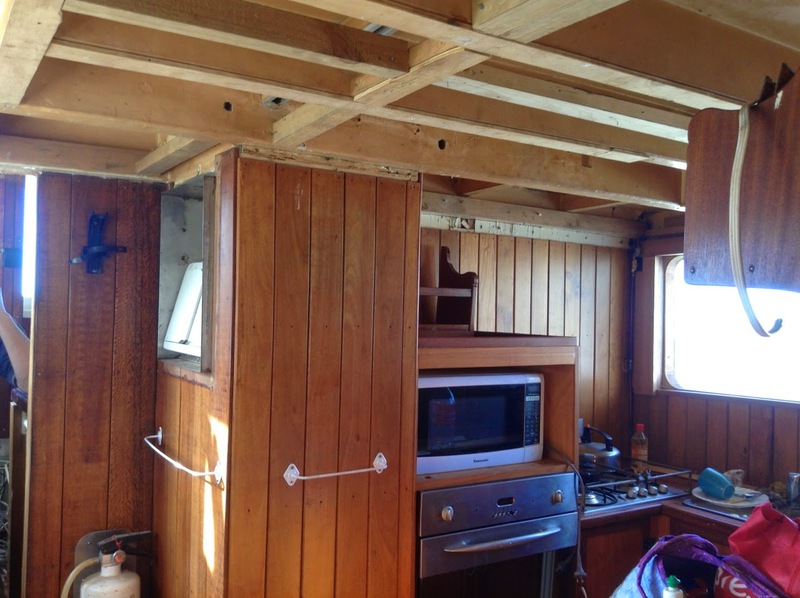 We don't mind the beams - it's a boat after all - and it gives a little more head room and the feeling of light and space. 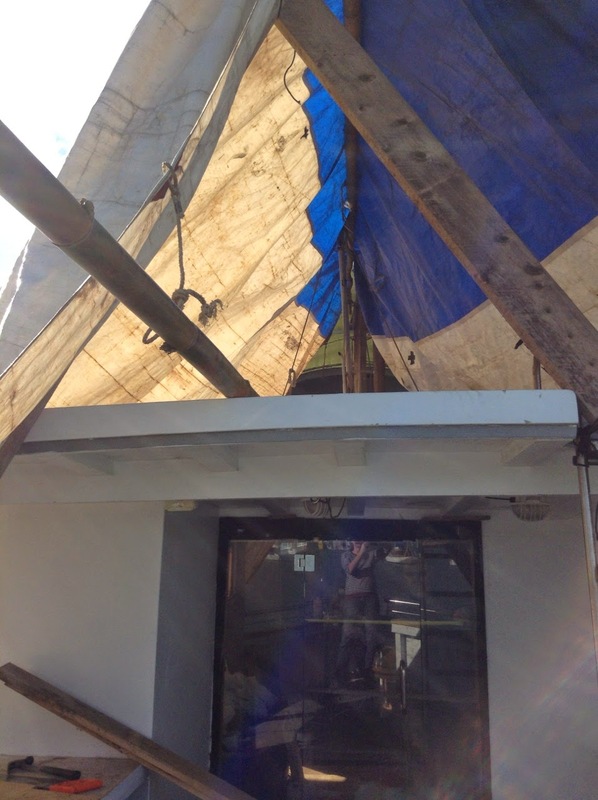 The top-deck is tarped up to try and dry it out so we can remove the few spots of rot and then fiberglass the whole thing. She flaps and rustles like some worn-out, forgotten and unloved circus tent. But one area where you can see a vast improvement is the fish hold. 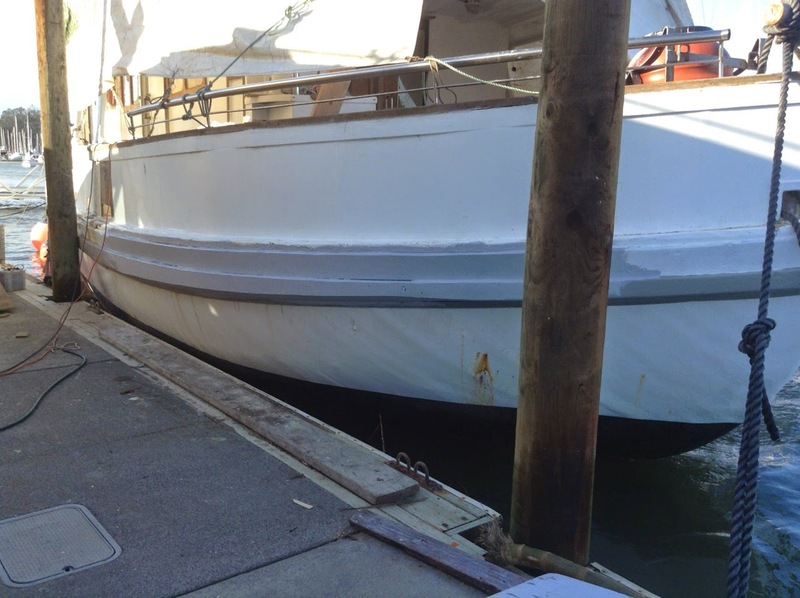 All the concrete and insulation is gone (she floats about four inches higher in the water now). The tar paper is scraped off the back bulkhead and the first coat of paint has gone on. So, to keep myself positive, I have taken a photo of this much improved space and am using it for the wall paper on my iPad. It reminds me that a huge change can happen in a short space of time, it just takes effort. I also use it to remind myself to be thankful that we got her so cheap, so we are able to afford some help - we are not doing all this work ourselves! At the beginning of the year, my 'word' that I wanted to pay attention to was action. When I think about it, that word must have penetrated my subconscious, because it was me that spurred my husband into the action of buying this boat (after some initial hard-selling on his part). We talked about it one weekend and bought it on the following Wednesday. Now I'm thinking my word needs to change. Perhaps to effort? It will take effort to get Cerego liveable and effort to get us out of here and onto Cerego. Or perhaps flexibility? We are going to need plenty of that as we adjust to our new space and lifestyle. Whatever my new word, I think I'm ready for the challenge. PS - I still quilt. I've been making many moons lately for various projects. This is a picture of a gathering stitch I'm doing around a freezer paper template - works well and achieves a smooth circle. Bringing back the thoughtfulness into my blog. The last time I was asked was in a 'formal' interview situation. I was asked why I started my blog, why do I keep blogging and what do I enjoy about it? My answer was about how blogging has introduced me to so many people, given me heaps of inspiration and given me a boost when people tell me that I've inspired them or helped them. But I've kept thinking about the question of why I write - I guess I'm having some contemplative moments - and I wanted to expand my thoughts here. I just want to say u are a lovely woman and mother and person.I 've been reading your blog since 2010,when I Googled calcivirus and a pic of the same needles that we were giving my cat came up.I clicked on it and it turns out u ad posted it due to the disease being let loose and were planning on vaccinating your bunnies at home. I love reading about your crafts, planting, children, u just sound like such a great woman. I live in pretty city-like place in the States, near New York, and always wanted a mom to teach me things like u do but my mom was not around, my grandma raised me,and she wasn't interested in that stuff,NOR were her friends. Anyway,she passed some time ago. I love seeing your beautiful quilts,I've always wanted a real quilt,and you seem to make them with so much care,love,and ease. I love your little pouches too, perfect for odds and ends and, see,u could do zippers! They really are so cool.Store bought has nothing on your lovely things. Well Ma'am, I just finally had to put this up. 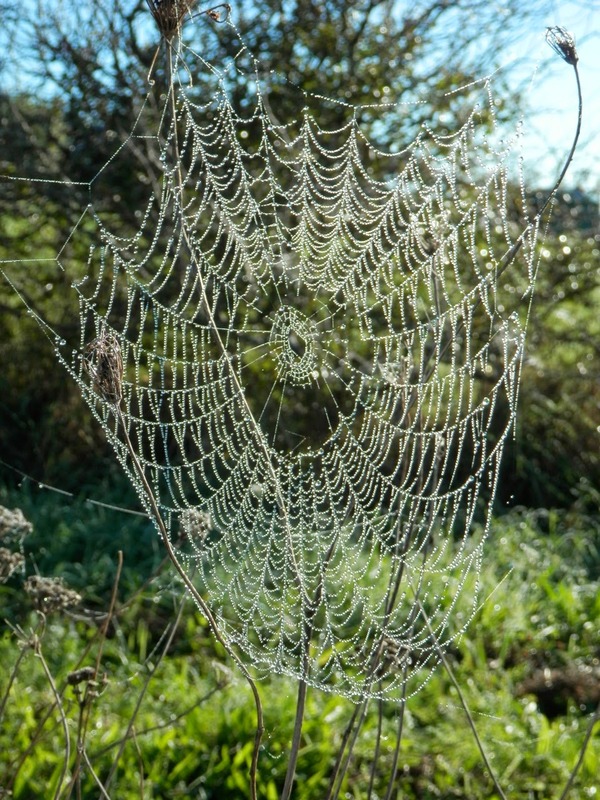 Thank you for your beautiful blog,and all the nice things you post pictures of. You are a really cool lady. Not only is that the longest comment I've ever had on my blog, it's probably one of the most ego-boosting too! But beyond that, it made me think. For me, walking and thinking go hand in hand. Crystalina probably had no intention in her comment other than to let me know she was reading, but she prodded my thought processes. Who is Crystalina? How different is her life from mine? How much have I unknowingly influenced or inspired her? And who else has read my blog and found something to help them, inspire them, make them laugh or scoff at? And what makes me blog different from others that she would read mine, rather than someone else's? I feel that over the last while my blog posts have become less thoughtful. I think they have become more 'diary-like' and less 'journal-like'. What's the difference? Well, to my mind, a diary is purely a written record what you have been doing, whereas a journal is exploring the meaning of what you have been doing and thinking. I think a diary can be useful too - it allows you to keep a record of your successes and mistakes and serve as a reminder of what works for you. It can help you pay closer attention to your actions - like a food diary - or help you keep track of your behaviour and responses to certain situations. 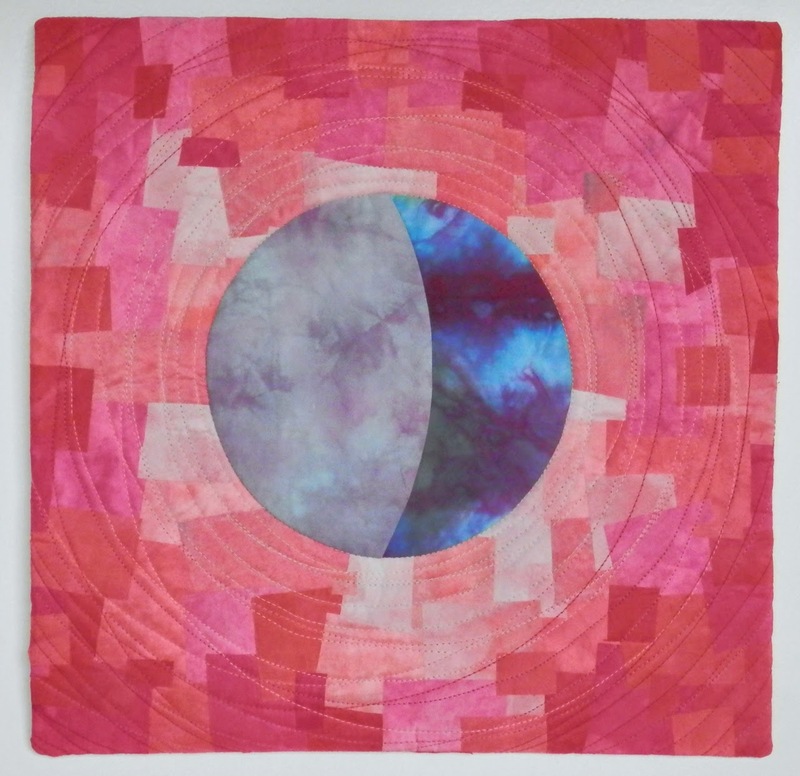 Jackie replied, "I started to document my quilting, finding the social aspect was a big plus and I loved it. 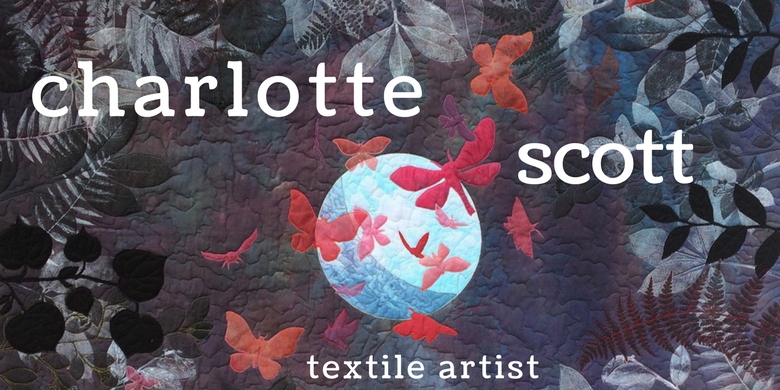 I didn't expect the social would become such a big part of my quilting life." 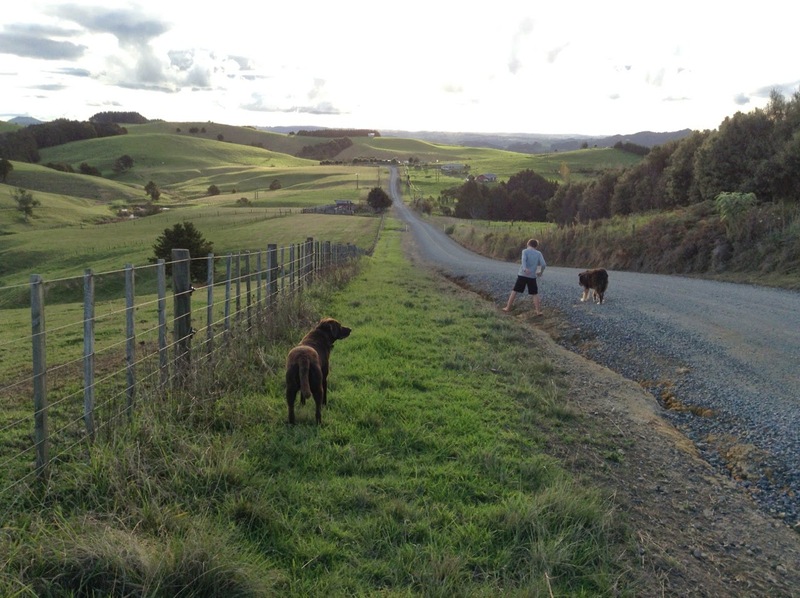 Amy said, "I began to journal and share our family experiences with family who lived far away. Then it got crafty. :) Multiple blogs now." JayeL responded, "I started to practice writing. Now I use the blog to keep track of my projects. I love my readers and their comments as well." 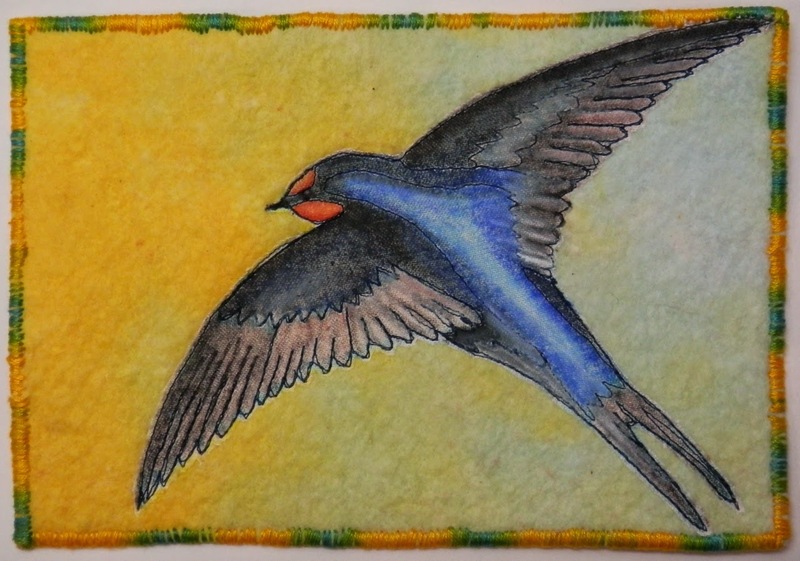 And Sandi commented, "To connect with other quilters and share things I've learned." Can you spot the common thread through all of these responses? Everyone wants connection with other people. But for me, connection with other people means giving something of yourself to connect with. Not just a few pretty pictures, or a log of what I've done over the last week. But pretty pictures AND what they mean to me. Or a log of what I've done over the last week AND what I've learnt and what I'd change. I know I sometimes hold back offering something to others. So I'm going to try and bring some of the thoughtfulness back. Don't worry, this isn't going to be a repository for my deepest, darkest angst! I've never written those sorts of things here (I'll keep that sort of thought processing for a paper journal so I can burn it if it gets too horrifying). But I am going to try and provide 'more' for my readers. More of the mistakes I've made and what I've learned, more of my work processes, more of my thoughts about life, quilting and child raising. And hopefully I can keep being an inspiration to Crystalina.